With the recent advances in regenerative endodontics, we have come to see the pulpal tissue in a new light. This has encouraged us to treat healthy pulpal tissue in ways that would seem counter-intuitive. For example, in the treatment of a decayed tooth, with immature roots - when the pulpal tissue is completely healthy, we may try an MTA pulpotomy on a permanent tooth, and give the tooth a chance to finish its development. We are finding new ways to perform apexogenesis procedures. The apexification procedure is becoming a thing of the past. In fact, I haven't performed an apexification in several years. This new approach to the pulpal tissue has brought up a new questions. 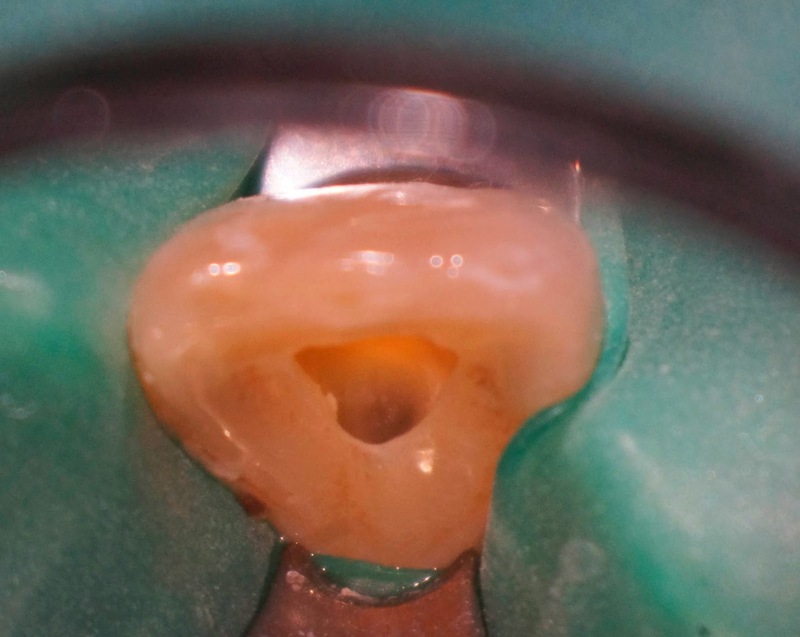 In a mature tooth, with calcific metamorphosis causing discoloration, is it really necessary to perform a root canal before internal bleaching? Conventional wisdom would say yes. But our understanding and respect for the pulpal tissue and its capacity to repair itself has changed my view on this procedure. 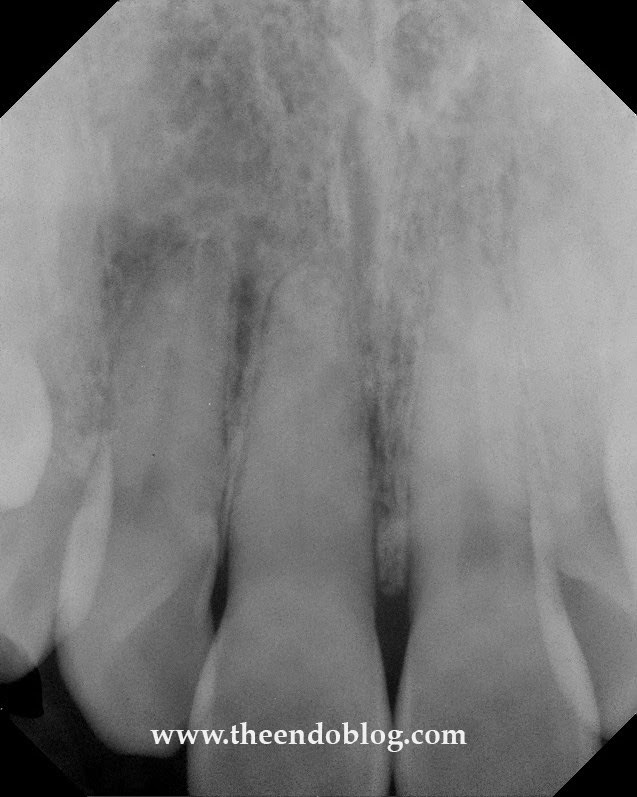 First off, teeth with calcific metamorphosis are often misdiagnosed as necrotic because they do not respond to thermal pulp testing. Electric pulp testing (EPT) is required to determine vitality on these teeth. 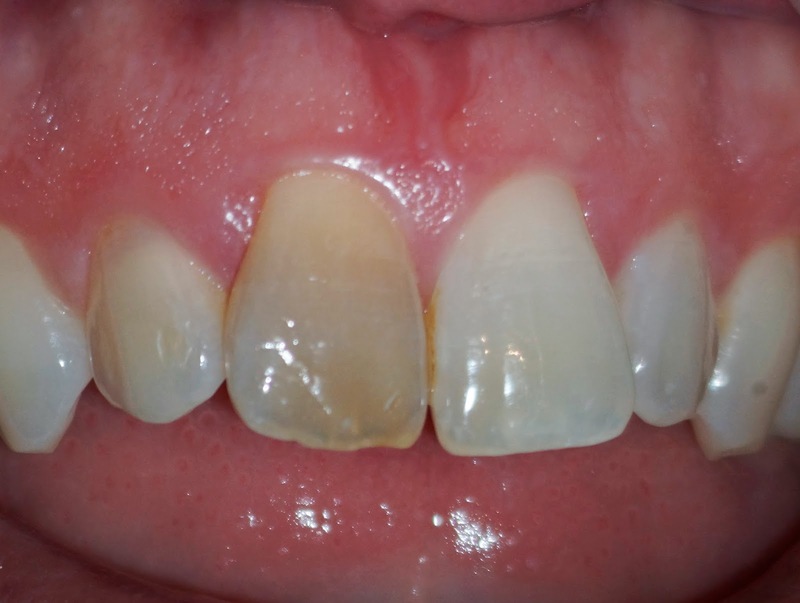 If these discolored teeth are determined to have vital, normal pulps and periapices - why not perform internal bleaching without RCT? The following case is an example of this procedure. Normal endo access with stain removal under microscope without entering canal. Glass ionomer barrier placed at the CEJ and Opalescence Endo placed in pulp chamber. Access closed with Cavit and bleach left for 1 week. Fresh bleach reapplied for a second week. 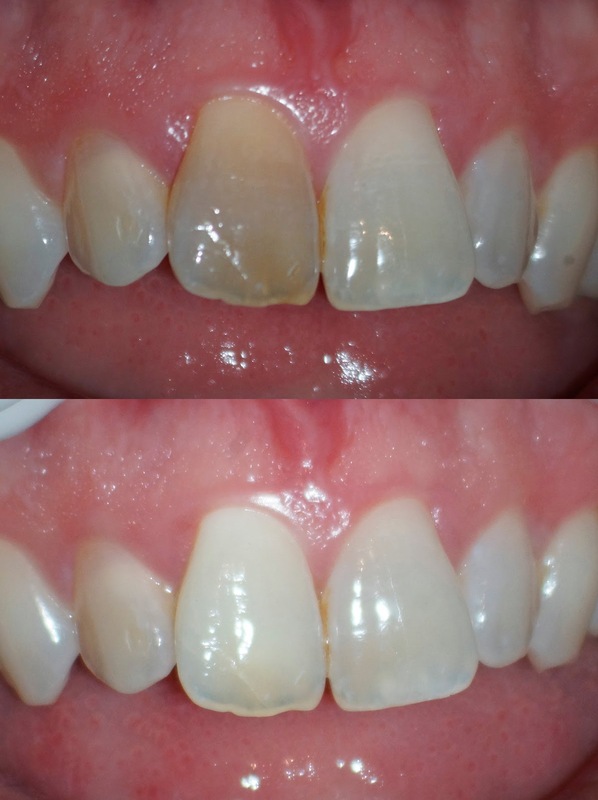 With no exposure of the canal system on a vital tooth, internal bleaching can be performed WITHOUT prior endodontic therapy. Love your blog and your work. I have a case like this coming in soon and I am hoping for similar results. Do you follow up sooner than one week? I usually follow up at one week. Sometimes, we'll do a second application. Just make sure you place your coronal barrier. You don't want bleach getting below CEJ. Thank you for this blog post. I really enjoyed reading it. I shall check back in a week for more of your great posts. Will share this with my dental colleagues as well.